You'll have a truly enchanted and unique look with this Jolly Ole St. Nick Santa rental costume. 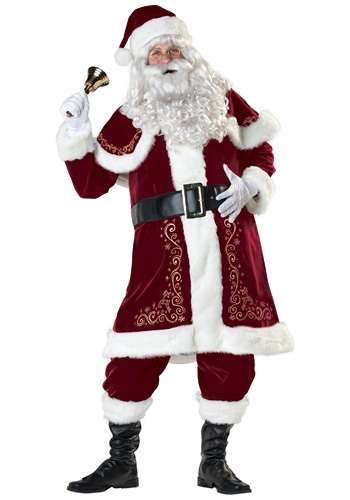 This 100% polyester Santa costume is a flocked deep red velvet coat with white faux fur that runs down the middle and the cuffs of the sleeves. Gold metallic accents embroider the bottom of the coat. The attached cape is also lined with white faux fur and gold metallic designs. This complete costume also comes with matching elastic waistband pants that also have white faux fur trim on the bottom of the legs. A black belt with gold buckle easily straps around the waist. The matching black boot covers fit around the shoe with an elastic velcro band. This costume also comes with a matching Santa hat, wig, beard, glasses and white gloves. Be sure to pick up one of our Santa beards, gold spectacles, and white gloves to complete this realistic Santa costume.